WordPress is a popular and powerful CMS (content management system) platform. Its popularity can bring unwanted attention in the form of malicious traffic specially targeted at a WordPress site. NOTE: Wpstack takes care of all these for you out of the box. There are many instances where a server that has not been protected or optimized could experience issues or errors after receiving a small amount of malicious traffic. These attacks result in exhaustion of system resources causing services like MySQL to be unresponsive. The most common visual cue of this would be an Error connecting to database message. The web console may also display Out of Memory errors. This guide will show you how to protect WordPress from XML-RPC attacks on an Ubuntu 14.04 system. WordPress utilizes XML-RPC to remotely execute functions. The popular plugin JetPack and the WordPress mobile application are two great examples of how WordPress uses XML-RPC. This same functionality also can be exploited to send thousands of requests to WordPress in a short amount of time. This scenario is effectively a brute force attack. The location of your web server log files depends on what Linux distribution you are running and what web server you are running. 111.222.333.444:80 555.666.777.888 - - [01/Jan/2016:16:33:50 -0500] "POST /xmlrpc.php HTTP/1.0" 200 674 "-" "Mozilla/4.0 (compatible: MSIE 7.0; Windows NT 6.0)"
The rest of this article focuses on three different methods for preventing further XML-RPC attacks. Ideally, you want to prevent XML-RPC attacks before they happen. The Jetpack plugin for WordPress can block the XML-RPC multicall method requests with its Protect function. You will still see XML-RPC entries in your web server logs with Jetpack enabled. However, Jetpack will reduce the load on the database from these malicious log in attempts by nearly 90%. Note: A WordPress.com account is required to activate the Jetpack plugin. Jetpack installs easily from the WordPress backend. First, log into your WordPress control panel and select Plugins->Add New in the left menu. Jetpack should be automatically listed on the featured Plugins section of the Add New page. If you do not see it, you can search for Jetpack using the search box. Click the Install Now button to download, unpack, and install Jetpack. Once it is successfully installed, there will be an Activate Plugin link on the page. Click that Activate Plugin link. You will be returned to the Plugins page and a green header will be at the top that states Your Jetpack is almost ready!. Click the Connect to WordPress.com button to complete the activation of Jetpack. Now, log in with a WordPress.com account. You can also create an account if needed. 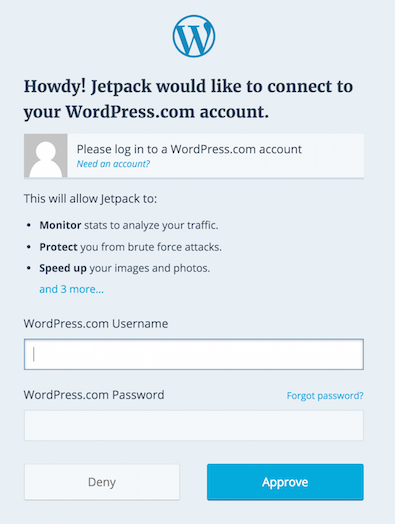 After you log into your WordPress.com account, Jetpack will be activated. You will be presented with an option to run Jump Start which will automatically enable common features of Jetpack. Click the Skip link at this step. The Protect function is automatically enabled, even if you skip the Jump Start process. You can now see a Jetpack dashboard which also displays the Protect function as being Active. White list IP addresses from potentially being blocked by Protect by clicking the gear next to the Protect name. Enter the IPv4 or IPv6 addresses that you want to white list and click the Save button to update the Protect white list. Alternatively, the XML-RPC block can manually be applied to your Apache or Nginx configuration. Warning: This method will stop anything that utilizes XML-RPC from functioning, including Jetpack or the WordPress mobile app. Whatever method you chose to prevent attacks, you should verify that it is working. If you enable the Jetpack Protect function, you will see XML-RPC requests continue in your web server logs. The frequency should be lower and Jetpack will reduce the load an attack can place on the database server process. Jetpack will also progressively block the attacking IP addresses. 111.222.333.444:80 555.666.777.888 - - [01/Jan/2016:16:33:50 -0500] "POST /xmlrpc.php HTTP/1.0" 500 674 "-" "Mozilla/4.0 (compatible: MSIE 7.0; Windows NT 6.0)"
By taking steps to mitigate malicious XML-RPC traffic, your WordPress site will consume less system resources. Exhausting system resources is the most common reason why a WordPress site would go offline on a VPS. The methods of preventing XML-RPC attacks mentioned in this article along with will ensure your WordPress site stays online. To learn more about brute force attacks on WordPress XML-RPC, read Sucuri.net — Brute Force Amplification Attacks Against WordPress XMLRPC.